Drama / Musikkfilm 2 t. 28 min. Ranveer Singh og Alia Bhatt for første gang sammen! Blir en av årets beste filmer! 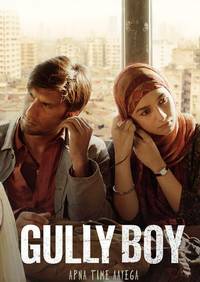 “Gully Boy” is about a 22-year-old Muslim boy named Murad from a ghetto in Bombay. The son of a driver, his parents have worked hard to get him educated just so that he can have an office job, meanwhile, Murad realises his calling is to rap. Art is a distant dream for the colonised poor of India and this story is about Murad chasing his dream and inadvertently transcending his class. film showcases street rap from the crevices of Mumbai’s by lanes. The poetry is conscious of the city's socio-economic fabric and highlights the challenges faced by the disenfranchised youth in the minority Muslim population.